An 1839 painting by JMW Turner has been tipped to fetch up to £18m, when it is sold at Sotheby's in London on 7 July. According to the auction house, Modern Rome - Campo Vaccino is among the most important of the British artist's works ever to go under the hammer. Last seen on the market in 1878, the painting represents the culmination of the painter's fascination with Rome. The record for a Turner was set by a view of Venice that sold for $35.9m (£24.1m) at a New York auction in 2006. At the time, the sale of Giudecca, La Donna della Salute and San Giorgio also set a new record for a British painting at auction. The sale of Modern Rome - Campo Vaccino will form part of an evening sale of Old Master and early British paintings. 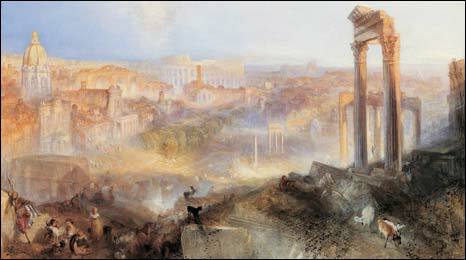 David Moore-Gwyn of Sotheby's said the masterpiece represented "Turner at his absolute best" and "one of the most evocative pictures of Rome ever painted". Bought by the 5th Earl of Rosebery and his wife Hannah Rothschild in 1878, the painting has remained in their family collection ever since.